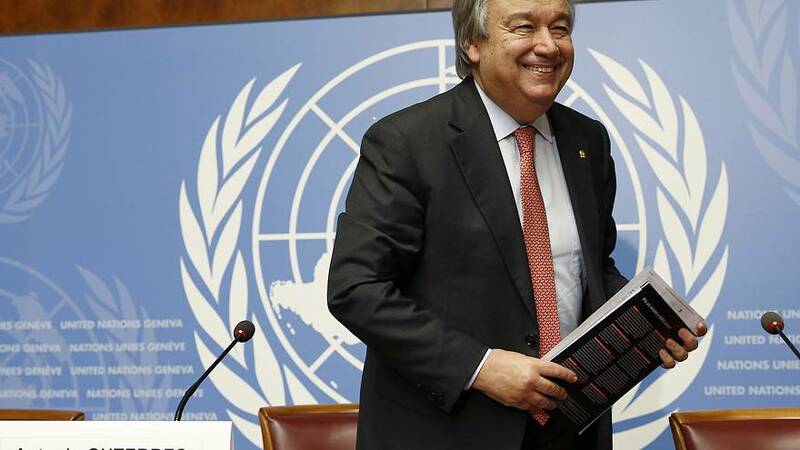 Former Portuguese Prime Minister Antonio Guterres is a step closer to being officially invested as the next Secretary General of the United Nations. The UN Security Council has unanimously passed a resolution formally recommending him to the organisation’s 193-member General Assembly for election as the next leader of the world body. Speaking before Thursday’s vote, Russia’s UN ambassador, Vitaly Churkin, said he hoped the UN Security Council would unanimously recommend Guterres. If fully approved, the 67-year-old will replace the south korean Ban Ki-moon, who will step down at the end of 2016 after two terms in office. The 15-member council, which has five permanent members, has been holding informal secret ballots since July in a bid to reach consensus on a candidate. Members could choose between “encourage”, “discourage” or “no opinion”. Guterres has come out on top of all polls. In Wednesday’s poll, he received 13 “encourage” votes and two “no opinion”. On Thursday, the Security Council adopted a resolution, again behind closed doors, recommending that the General Assembly appoint Guterres for a five-year term from January 1, 2017. The resolution needed nine votes in favour and no vetoes to pass. 13 people were nominated in the race to become the next UN Secretary General. However, three had already withdrawn before Wednesday’s secret ballot. For the first time, the candidates were allowed to make hustings-style speeches to the General Assembly in a bid to create more transparency in the opaque selection process. The UN has had eight successive male leaders. This time around, seven of the candidates for the position were women amid a push by a third of the 193 UN member states for the first female UN chief in the organisation’s 71-year history. “Today, after our sixth straw poll, we have a clear favourite and his name is Antonio Guterres,” – Russia-UN Ambassador Vitaly Churkin. “In the end, there was just one candidate whose experience, vision and versatility across a range of areas proved compelling,” – US-UN Ambassador, Samantha Power. “Although it is high time for a woman, the most important thing for the UK was the qualities of the leadership of this position,” – UK-UN Ambassador Matthew Rycroft.